I have been training in La Ventana, Mexico and San Francisco Bay for the past month with most of my sessions on the Edge 15m and Zephyr 17m. The main problem with other light wind kites is they deliver tons of low-end power, but once you’re out of the water and riding you get overpowered quickly. With most light wind kites you carry so much extra power that you’re fighting to stay upwind instead of enjoying your session. 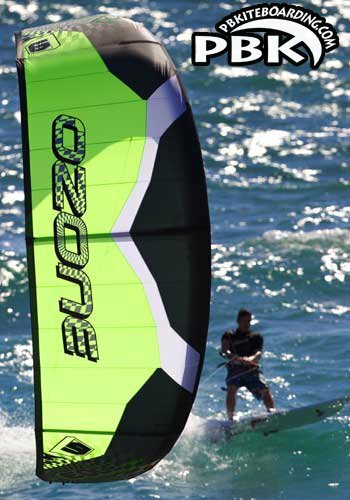 Ozone has 2 kites that deliver the best of both worlds. I find the range on the 17m Zephyr to be optimal in 5 - 11 knots of wind on my race board and 6 - 15 knots on a regular 134cm twin-tip. You can definitely handle more wind on the race board, but I struggle to keep in the groove upwind in over 12 knots. I’m on the lighter side at 165 pounds so I need to be in optimal trim to hold down full power. The ease of riding on a twin-tip while still fully powered in light conditions is truly impressive. I can manage fun lofty jumps and kite loop transitions while everyone else is sitting on the beach. There are many days where it never gets above 10 knots and this is where the Zephyr really shines. Add a door, surfboard, directional or race board and you’re laughing. One of my favorite things about light wind kiting is ripping in almost completely flat water. The key difference between the Edge and Zephyr is in the profile and power range of the kites. The Zephyr is perfect for that consistent low-end power needed to keep a twin tip upwind in the sub 10-knot wind range. With the modern race boards generating power from fins, apparent wind and board speed, it requires a little more effort to keep the board in optimal upwind trim. The Zephyr is perfect for ultra-light race board conditions 5 - 10 knots for me at 165 pounds. If you’re a heavier rider and need a bit more power the wind range can easily be extended. The Edge 15 has a larger wind range when paired with a modern race board. Usually I’m in the groove from 5 - 15 knots of wind. On of the hardest things about racing is being able to cope with changing wind speeds. If you can make it through the lulls better than your competition you can make significant gains. The big advantage of the Edge is delivering enough power to accelerate out of a tack without getting overpowered upwind. This kite flies faster and further forward in the power window allowing you to hold a higher, faster line. The quick turning ability and smooth acceleration has significantly improved my downwind runs. Instead of waiting for the kite to reach the top of the window the Edge actually pulls on the up-stroke giving you and extra boost in working your race board downwind. Why is this important? Racing isn’t just about going fast: whoever is closest to the mark has the advantage and getting inside another racer at the leeward mark can be the difference in winning and losing. If you ride twin-tips or surfboards the Edge 15 can extend your season and give you the performance and fun you expect. On those lighter days where you just don’t have enough to get up and ride, the 15 will give you that extra low end power to have a great session. With the ultra light bar pressure and increased top end you can still have that extended light air session. The construction and quality of the Zephyr and 15m Edge is amazing and Rob did an excellent job keeping the kites light and nimble for improved light wind performance. There is nothing worse than having your kite fall out of the sky while trying to get off the beach. Both kites are amazingly easy to keep in the air and flying. The Zephyr and Edge have the new Ozone high-speed inflation valves. This makes a huge difference in the effort and time to inflate and deflate larger air volume kites. When you need to inflate 3 - 5 kites a day for racing this allows you to save that energy for the racecourse. You wouldn’t think this is a big deal, but by the 5th race of the day you will know what I mean. Put that extra energy into winning instead of pumping. If you want to ride on those perfect light wind days while everyone else watches you with envy, Ozone has your weapons of choice with the 2011 Zephyr and Edge 15m.